We don't get many new or limited edition Toffee Crisps here. In fact in over five years of blogging here, this is the first one we've featured on this site. Honeycomb sounded a bit more adventurous than the usual UK limited edition flavour of either caramel or salted caramel, but admittedly not much. It still sounded like it was well in the safe zone. 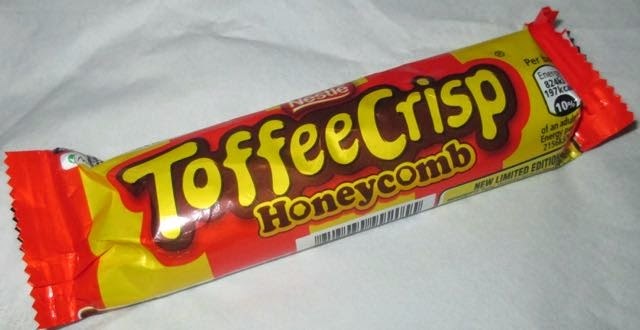 I like honeycomb, or cinder toffee, as I like to call it. I opened up my bar and the chocolate had melted a little inside the wrapper, this made me smile. Not the chocolate bars fault in any way but the wonderful signs that the weather might just be improving! Im sure I've mentioned before how much I like a mix of textures in a product, well this bar lit up my world. There is a softness from the chocolate, light crispy feel from the cereal and a more defined crunch from the honeycomb pieces. I really like the feel of the bar, but also the honeycomb added an impressive flavour too. I thought it might be mild, conservative and a bit lost, but the second the wrapper was off the aroma from the honeycomb was apparent. I liked the burnt sugar flavour it added, it stood out well and worked perfectly with the chocolate. All in all I felt that although teetering on the side off safe this had just enough newness to excite me and the honeycomb edition is a much welcomed addition to the shelves. Certainly a bar I'll be picking up again.